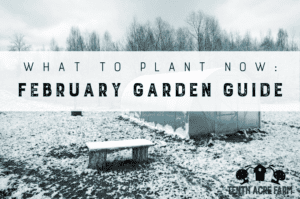 In this January Garden Guide, you’ll see how I get organized for the garden year, what I’m harvesting this month, and some of the gardening maintenance tasks I work on at this time of year. Click here to see my Year-Round Gardening Calendar. January is one of my favorite times of year because I love the opportunity to start anew, make new agreements with myself about how I will spend time in the garden, and determine what kinds of experiments I will run to continue learning and improving. As an example, this is a sample January calendar based on my gardening year in USDA hardiness zone 6a. You may need to make adjustments for your climate. See below under ‘Garden Planning’ for more ways to adjust this schedule for your needs. When I block out time for garden tasks, I always harvest first. That’s because when I don’t, I usually get distracted by other things and run out of time! However, the goal of all of this gardening is to harvest fresh, healthy food for my table. so to make sure that happens, I prioritize harvesting over other tasks. In the previous fall, I sowed winter crops and covered them with row cover or a cold frame. You could also use a hoop house, greenhouse, or some other kind of protection to suit your needs. For example, cold frames are wonderful little contraptions for extending the harvest throughout winter, as well as getting a jumpstart on spring planting. Learn more about cold frames here. 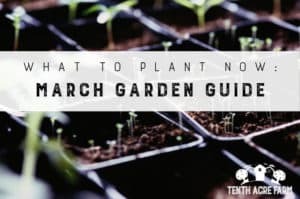 Here are some things you’ll need to do to prepare for the garden season. Would you like some help with your planning? Read about four essential garden planning tools that will help you kick off your garden season. When you purchase my award-winning book, The Suburban Micro-Farm, you get the four garden planning tools as a bonus, including my Seedstarting & Planting Worksheet, that will AUTOMATICALLY GENERATE all of your planting dates based on your frost date. Amazing! Meanwhile, another thing that I do in January is to set up my indoor seed starting system. Here is my step-by-step guide. I try to complete the following garden maintenance tasks in fall, but sometimes that doesn’t happen! Completing them in January will make subsequent months run much more smoothly. Cut back dead plant matter. If it was diseased I put it in the trash, otherwise I compost it. Actually, I like to compost in place by chopping the organic matter into smaller pieces that will feed the soil and break down easily. Leaving the roots intact feeds the soil life as they decompose. See my article Building the Right Compost Bin to take advantage of the free organic material you have available to you. Here are 5 weeds you want in your garden. Also see when weeds are good. For most weeds, I chop them back to at the soil level, but leave their roots intact, and then compost them in place. Add soil amendments to inactive gardens with a digging fork. If you have compost soil or composted manure, now is the time to add it. It’s the perfect time of year to improve soil. My Guide to Organic Soil Amendments will show you exactly which amendments are right for your soil conditions. Click here to get my free soil guide. Rake leaves and make leaf mulch, or save them for composting. Cover beds with a deep mulch. I like shredded leaf mulch because it’s free, but chemical-free straw is good, too. For more of my mulching tips, see Mulching in the Permaculture Garden. Clean, repair, and replace tools. Did you leave last garden season in a huff, leaving the mess until spring? Get a jump on this year’s garden by getting outside in January, weather permitting, to do some clean up work. Looks the same only much tidier, and done in under an hour. And because the mulch is just sitting on top, it will be easy to push aside for planting new things in the spring! Another note: I didn’t pull out the old plants, I cut them off at the base. Why? Because their roots will biodegrade, enrich the soil, and feed the next plants to be planted here. This is how to manage the soil in a no-till garden. What gardening tasks do you tackle in January? What a helpful blog article!!!!! Wonderful thoughts to warm these cold days. Thanks, Amy. Ordered catalog-“check”. Thanks Amy for your suggested catalog list. Never thought about rotation -“check” thanks for bringing this to my attention. Can’t wait for the Rain Water class…..I have a river flowing through my house :-/, would be good to reap the benefits. Would love to help with your seed planting for community garden….. This is wonderful! Great BLOG!! Great!! So what should we do about the three feet of snow and ground as hard as granite? Just kidding- there are a couple of hundred things that should be handled right now, and your thought are what I need to get stated! Thanks. That granite-hard ground stymies even the most eager of gardeners, doesn’t it? 😉 Good luck with your garden planning–which I hope can be done in a warm, cozy place! If the winter in your area has been damp rather than snowy, January is a great time to build and repair fences and other structures. The ground is soft enough to almost just push posts etc in, and there is little growth to obstruct your progress. Much easier and faster than doing it in the harder ground of spring and summer. And the work keeps you warm! That’s a great tip–lots to do if the ground isn’t frozen! I’m in zone 9 (near Palm Springs, CA), so I just planted chard, cauliflower, green and red cabbages. we pretty much have a 365 day growing season, but farmers here in the valley DO take 2 weeks off in August and let the fields lie fallow. I added organic material to the soil and am working on my compost pile. We had nice rains for 2 nights now and another storm is moving toward us next weekend, so all that rainwater is welcome! Current garden is 2 feet under a bed of snow. Just reading these posts to torture myself! I would have to dig through a 4 foot drift to find the garden gate. At least we have a high in the double digits today….11 not counting wind chill. Weeping! Hi Amy. Do you know if grow lights for seed starts loose their effectiveness over time? I had heard it somewhere and wondered if there was any truth to changing out your light bulbs even though they still work. Mine are about four years old. I can’t point to any literature that proves this definitively, but I can say that we did need to switch out our bulbs every few years. I hate the idea of switching out bulbs that seem to be working perfectly, but indeed, the lackluster results I was getting from my plants instantly improved with the change in bulbs. I would love to hear if others are experiencing this, as well. Question: sprouted sweet potatoes potted in indoor soil are showing tiny crystalline-looking dots on the topside of the leaves; what might they be? I’m not sure what that could be. Some guesses: salt build-up (but that usually shows on the top of the soil medium), sap-like sugar excretion (but that usually comes from the roots rather than the leaves), or some kind of fungal spore (but I don’t recall fungal spores that look like this). Are they in a soil medium or simply rooting in water? Either way, flush the water well with fresh water, and be sure to do this regularly. You may try using filtered water to reduce any mineral buildup. These are all guesses since I haven’t seen this before.